In South Africa – as in much of the rest of Africa – AK-47s arouse feelings of fear and paranoia, mayhem and death. Yet there is also a deep reverence for the widow-maker, as Mikhail Kalashnikov’s rifle has been named. Across Africa, it has been the weapon of choice during liberation struggles and wars; it is also used in cash-in-transit heists and other crimes. But artist Ralph Ziman sees art in these weapons of destruction. With the help of Zimbabwean wire beaders, he illuminates our fascination in an absorbing way, through beaded beauty. Gun culture is prevalent in South Africa. In an artistic reversal, Ziman spent six months collaborating with artists and building the weapons of art. 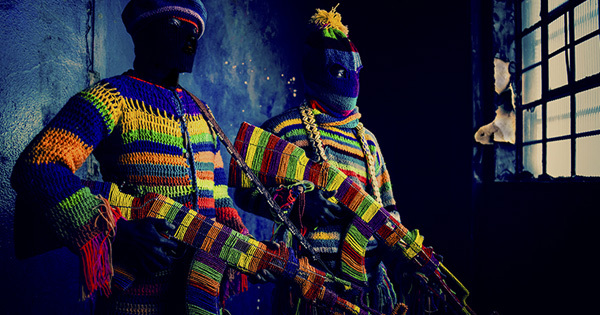 Together they have created an exhibition of beaded guns as an expression of colour and beauty. The Zimbabwean craftsmen created replica guns from wire and beads, and then were photographed in downtown Joburg by Ziman for his exhibition, Ghosts. 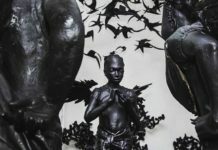 It was first exhibited at C.A.V.E Gallery in Los Angeles in February, were Ziman now lives, and opened in Cape Town at Muti Gallery on 24 April. It will run until 18 July. South Africans, he believes, are intrigued by guns and in making to make art out of these war tools, Ziman is possibly demystifying the fear of the gun. The gun culture of the country was brought to the attention of the world with the Oscar Pistorius trial. On trial for shooting his girlfriend through the toilet door, witnesses have spoken of the Paralympic and Olympic athlete firing a weapon in a restaurant and out of the roof of a car. The news is peppered with shootings, many of them accidental, such as children playing with their fathers’ guns. 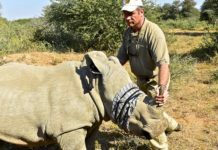 A case in point: a seven-year-old boy was critically wounded in the chest at Gallagher Estate, in Joburg on 28 April, where the HuntEx2014 gun exhibition was taking place. A man allegedly went into the toilet with his son, and his gun accidentally went off. This reverence for guns is not limited to South Africa, though, Ziman says. The AK-47 is “loved, revered, and fetishised” across Africa, despite being at the heart of bloody conflicts. The title of his exhibition, Ghosts, refers to those killed by the weapons, as well as those who traffick them. 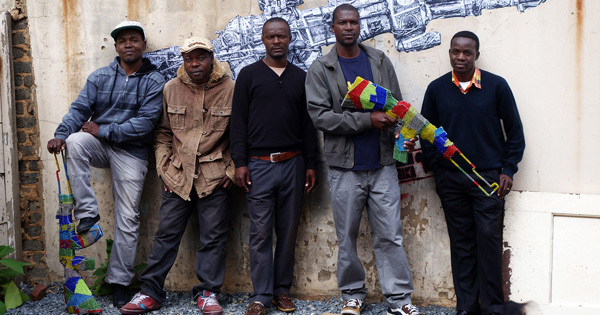 The completed bead guns were the subject of a photo shoot in downtown Johannesburg. The guns are held by their makers, dressed in strange costumes, their faces hidden by masks and sunglasses. The resulting photographs look otherworldly with their fluorescent glow, illuminated as if by black light. But despite the surreal aesthetic of the series, a creeping uneasiness seeps in as the AK-47 sculptures bear weighty connotations. 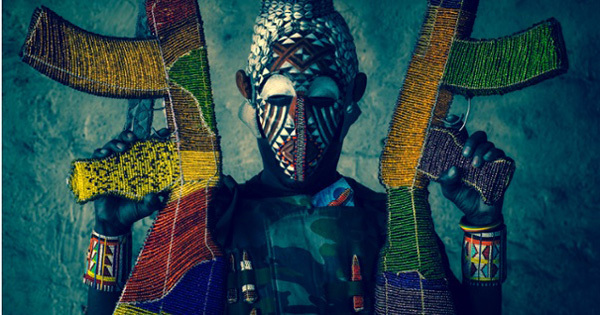 Ziman’s intention is political: “Ghosts prods the viewers to learn more about the arms trafficking industry from powerful, foreign nations to Africa and the violence and injustice it has bred,” he says. 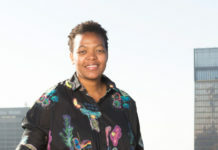 Best known for his Venice murals and music videos with the likes of Toni Braxton and the late Michael Jackson, Ziman also wrote and directed the film Jerusalema, South Africa’s 2009 Academy Awards official submission for the Foreign Language Film category. It tells the story of a young hoodlum’s rise from a small-time criminal to a powerful crime entrepreneur during the turbulent years before and after the fall of apartheid. 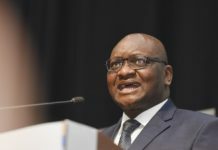 He has always loved the brightly coloured beaded trinkets made by men – usually Zimbabwean – and sold at the side of the road around South Africa. In 2013, driven by the idea for Ghosts, he stopped his car one day in Joburg and approached some of the craftsmen, asking them to make him a replica of a Kalashnikov. 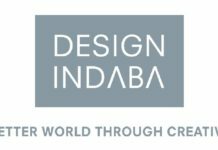 The craftsmen are Boas Manzvenga, Panganai Phiri, Lenon Tinarwo, Telmore Masangudza and Kennedy Mwashusha. He shipped the replicas, plus about 1 000 hand-crafted rounds of fake ammunition, to Los Angeles, where they were auctioned to raise money for Human Rights Watch and Control Arms. “I like to see it as a sort of reversal of the arms trade,” he says. Ghosts is at Cape Town’s Muti Gallery until 18 July.